Goodmans launches the world's first talking Freeview box | What Hi-Fi? Working with Harvard International, Pixsan and Loquendo, the Goodmans box is the first to integrate text to speech capabilities. Available from August, the Smart Talk Freeview digital box allows users to access speech-enabled information to make navigation far more user-friendly for elderly, blind or partially sighted, or severely dyslexic users. Consumers can control the way text on screen is read out to them and change the size of the text on screen. 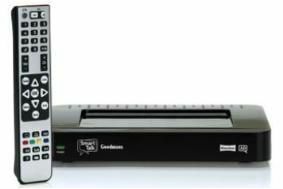 Goodmans' Smart Talk Freeview digital box is supplied with a Crystal Mark User Manual approved by Plain English and will be supported by a national marketing and PR campaign, including the Smart Talk website. The Smart Talk box will cost £99 and will be available to order from the RNIB and selected high street retailers.